AnaYela is a small, 300-year-old city palace in the heart of the Medina, the historic city of Marrakesh. “Ana Yela” translates literally as “I am Yela” and the architecture tells the story of a girl called Yela who once lived in this riad. 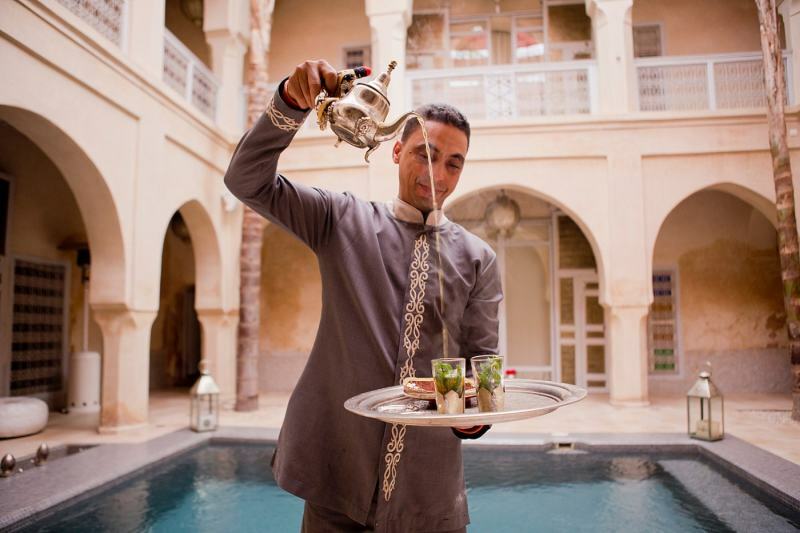 The restoration of the riad took months and was carried out using only traditional Moroccan craftsmanship, for which Marrakesh is famous throughout the world. A renowned calligrapher hammered the story in silver on the vast doors through the house, like pages of a book. Every single piece of furniture, every lamp, all the decorations, are individually handmade by Moroccan artisans. As a result the house as a whole is a spectacular piece of art in itself. Here all one’s senses are beguiled and inspirational energies and emotions are awoken and set free in this unique atmosphere. Morocco is also famous for its hospitality and the friendliness of its people. In the Anayela you encounter a new dimension of service – warm, attentive, personal. Staying at the Anayela is an authentic, cultural, luxury experience for the soul and brain. A calm place for relaxation but also subtle inspiration and stimulation of the senses. We care about each guest and want to make your stay unforgettable! Our biggest reward is the smile on your face. Anayela – A place of Inspiration!